Artist/Activist Atena Farghadani has had her 12-year, nine-month prison sentence reduced, CRNI Deputy-Director Nik Kowsar has learned. Appeal Court No. 54 of the Province of Tehran has reduced the artist’s sentence to 18 months — which, by her lawyer’s calculation, means Atena Farghadani should be out of prison sometime in May. Nik writes: Ms. Farghadani “has been acquitted from charges of undermining national security, and her three year imprisonment for insulting the Supreme Leader has been suspended for four years. “The 9 month sentence of insulting the President, Members of Parliament and the guards of ward 2-A of Evin prison has changed to a monetary fine (not yet determined). The 18 months prison for ‘propaganda against the regime’ has been confirmed by the appelate court. 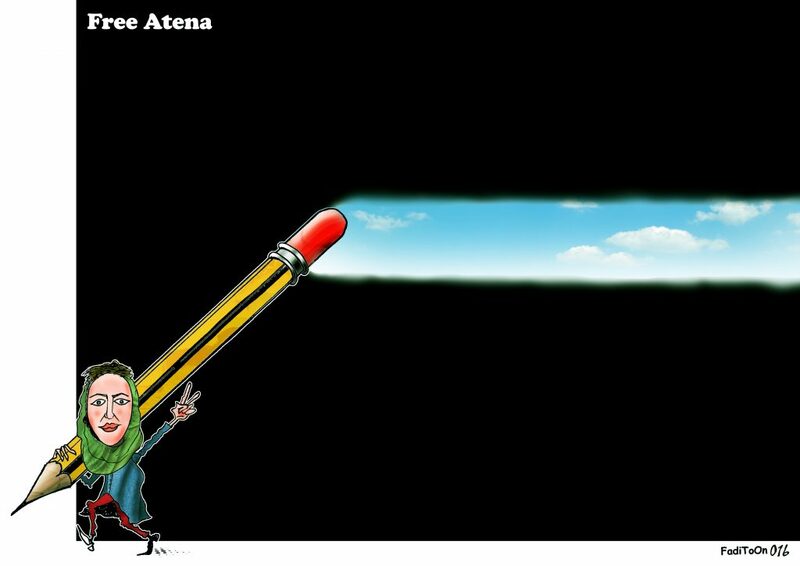 Atena Farghadani’s trial stemmed from a cartoon she drew and posted on Facebook, which protested a move by Iran’s Parliament to reduce womens’ rights. Ms. Farghadani was presented CRNI’s Courage in Editorial Cartooning Award in absentia in 2015.